Beyond this bridge you’re on your own; I’m not responsible for your safety,” the lone soldier manning the Central Reserve Police Force (CRPF) bunker at the bridge that led to Salang village told us as we walked over. Photographer Deepu Philip and I were on assignment in Arunachal Pradesh, one of the most beautiful parts of the country. We were accompanied by another photographer, Prahas Nair. Changlang, our destination, is in the south-eastern corner. Late August-early September, when we visited, is one of the best times of the year, when the monsoon is tailing off, the cold hasn’t yet begun to bite and the air is clean, with just a hint of the winter freeze. We’d made the longest train journey of our lives, from Kanyakumari, the southernmost point, to Dibrugarh in Assam, which we reached on August 25. The next day we went to Mohanbari where the inner line permits for travel into Arunachal are issued. On the 27th, we were in Changlang after a long and torturous journey by antiquated bus on a rutted, pitted road that snakes up and down the hills forever, it seems. But the views are some compensation. It’s just 50-60 kilometres from Margherita in Assam to the district headquarters, but it took us more than four hours to get there. We were trying to track the opium traffic in an area that is a theatre of the Naga insurgency, the country’s oldest, a struggle that began just a little after Independence and still remains unresolved. It’s the backdrop to everything that happens. The militants seem to be everywhere, just like the military, and even more ubiquitous. The army, on the other hand, is in your face. “The guerrilla must move amongst the people as a fish swims in the sea” Mao Zedong wrote in his classic manual long ago. The militants seem to have taken that lesson to heart. Changlang, like many other playgrounds of turmoil, it is a land of hypnotic natural beauty surrounded by hills between 200 metres and 4,500 metres. The vegetation ranges from lush tropical to the ultra-Alpine and the name comes from changlangkan, “a hilltop where people discovered the herb used for poisoning fish in the rivers.” It is also, as is often the case with conflict zones, a place of vital strategic significance. The southeastern corner touches Myanmar, perilously close to the Golden Triangle, an area of around 9,50,000 square kilometres that overlaps the highlands of Myanmar, Laos and Thailand, one of Asia’s two major opium producing belts along with Afghanistan in the Golden Crescent. On the face of it, Changlang is a blessed land. The land is fertile and ideal for farming, and it has immense tourism and hydropower potential. Its oil and coal reserves could generate thousands of jobs. The location makes it a viable route for trade with Myanmar. Instead, Changlang’s economy, according to deputy commissioner (DC) Chanchal Yadav, is a shambles. The killer, she says, is a deadly combination of opium and insurgency. Scores of addicts in the longhouses of the district provide grim testimony to the all-prevalent hopelessness here. As for the second, it’s around the corner and it’s everywhere else as well. “Changlang is part of the demand for Greater Nagalim by Naga militants, both Khaplang(K) and Isak-Muivah(IM) factions of the National Socialist Council of Nagaland (NSCN), which has rendered this land of immense possibilities insurgency torn,” she says. Nagalim, the promised land for which the insurgency is waged, is envisaged as a kingdom of Christ inhabited by the Nagas that includes at least 35 tribes of north-east India and north-west Burma, the turn to Christianity is considered to have far-reaching implications. Both NSCN(K) and NSCN(IM) are resolute advocates for “Nagaland for Christ”. “They’re Christian missionaries who carry both Bible and guns at the same time,” says Phikam Kanglom, a 24-year-old unemployed resident of Old Changlang village. Threat letters have been reported to be issued to the Central Rangfrah Administrative Council (CRAC) of the district, asking it to stop all socio-cultural and faith promotional activities of the Rangsomhum, the Rangfrah temple. Everyone stays in Circuit House (the official government guest house) as there are only two other lodges in Changlang, one of them in a slum. It’s on a hilltop, with a panoramic view of the surrounding country in the morning and evening, magically lit by the rising or setting sun. The military presence is less obtrusive as well. Just three kilometres away, in plain sight, is Salang village, controlled by the NSCN(K), where it has set up “Rocket Camp”. The NSCN(K), according to various estimates, has at least 3,000 armed fighters, concentrated in eastern Nagaland, Chirap and Changlang districts of Arunachal, as well as Kachim province of Myanmar. Officials at the DC’s office also dismiss our questions. The reason, they say, is that the camp exists with the implicit acknowledgement of the government. “Look, the village is in India, and the DC office is nearby, so there’s nothing to worry about unless you deliberately create some issues. But that can happen in any village, in, Kerala too,” says Sreejesh Kumar, a native of Kollam in Kerala, who came to Changlang 20 years ago. He’s personal assistant to Marina Khenglam, chair of the Zilla Parishad. For the locals and for the army, the insurgents next door are just one more fact of everyday life, a truth they have reconciled too. There is even an impression of harmonious coexistence. It’s a disturbing state of peace, a chimera of order and sanity, a drugged peace, according to Phikam Kanglom. He wonders why five per cent to 15 per cent of funds for the various projects in the district are siphoned off to NSCN(K), apparently with the sanction of the administration. “It is as if the administration is paying these people some sort of tax,” he says. One can’t address opium without addressing the insurgency, and neither can be resolved without addressing the corruption. So I dial the number and get T. He instructs us to wait in the Circuit House lounge for one of his men to talk to us on his behalf. Half an later, a tall, well built man walks in and introduces himself as Munna, T’s emissary. “I’m a non-tribal local, originally from Bengal. I’m not one of them, but I’ve been told by T Saab to come and talk to you.” He seems at home, as if he owns the place. First he takes off his shirt and spreads it on a sofa. Then he starts questioning us about ourselves and the magazine. According to Munna there’s no insurgency. He checks my notebook in detail, and calls T. I ask for an interview but Munna says T is busy. He checks the notebook again, and asks who gave us T’s number. I simply repeat that it’s our policy not to give such information. He seems to accept this. Nearly everyone I speak to in Changlang is cagey about the insurgency. Even the army, which has been fighting the insurgents, it seems, forever, is extremely reluctant to disturb the status quo. It has been criticised, sometimes sharply, for its apparent inertia and for it habit of playing off one group against the other. In an opinion piece published last year, R. N. Ravi, chairman of the Joint Intelligence Committee, appointed in August as the government of India’s interlocutor for the Indo-Naga peace talks, accused the army of overriding the government during Manmohan Singh’s tenure. In another opinion piece published in The Hindu, Ravi had pointed to the “reckless ceasefire” for the last 17 years between NSCN(IM) and the government as the pivotal cause for pushing the Nagas into a state of civil war. The change of government at the Centre has sparked a new concern. The locals seem to be convinced that there’s going to be a radical policy shift which will re-define the political topography of the district. The idea is based on two strongly held opinions. The first is that Sonia Gandhi is a Catholic who had a soft corner for the Christian insurgents. The second is that Prime Minister Narendra Modi will not tolerate Christian insurgents. It remains to be seen what will happen but change is likely, with General (retired) V. K. Singh as minister for the north-east with Cabinet rank. Khuchep’s Nonghki Kamba Longchang favours maintaining the status quo. “The administration is right to let the insurgents be so long as they don’t violate the unwritten laws of peaceful co-existence,” he says. “We’ve learnt to live with each other. They don’t come where we live, so why should we go and disturb their peace?” But he doesn’t disguise the underlying fear. Politicians too, across parties, underscore the sentiment. Thikhak Taiju was the local MLA for three terms until he lost the last election. He’s one of the richest men in Changlang; he owns most of the shops in the market and has a marketplace named in his honour—T. T. Point. He says everyone knows opium comes from Myanmar through the insurgents, but to take them head on would be imprudent. On August 30, the day after meeting us, Taiju sent his son to Circuit House. He wanted us to meet him at home. He asked if we worked for television and whether his views would be televised. He requested us to “not write anything that might land me in trouble. Opium, as you know, is a very sensitive issue here, and, as you know the insurgents live right next door.” There was no attempt at empty bravado, or to project the image of a fearless leader. “You people will go tomorrow or day after. But I have to continue living here,” he said. 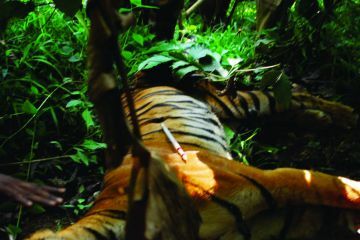 According to official figures, homegrown opium accounts for 20-30 per cent of the total consumption. The rest comes through the porous 290-kilometre border with Myanmar. There are 22 border pillars on the international border, verified annually by the Border Guarding Force, i.e., the Assam Rifles. The numberless, unmanned, porter tracks on either side of the border offer safe passage to the peddlers. The homegrown opium is consumed locally in raw form, without processing. The commercially transacted stuff in township areas comes mostly from Myanmar. It is also used in barter trade by Myanmar citizens. While poppy cultivation is rampant in the adjacent districts of Lohit and Anjaw, Changlang—except in the interior villages of Khimiyang, Manmao, Rima, Miao and Diyun circles—is relatively free of cultivation owing to a massive awareness campaign, both about the consequences of opium addiction and about the Narcotic Drugs and Psychotropic Substances (NDPS) Act—and destruction of standing crop on a large scale. De-addiction centres have been opened. Marina Khenglang, however, feels these are cosmetic measures. She believes the insurgents have to be tackled with commitment and conviction, or, if that is not possible, radical alternatives must be explored. She herself has a plan: she wants to legalise poppy cultivation in Changlang and eastern Arunachal Pradesh. “If you legalise it for pharmaceutical purposes, it becomes a great source of income. One of the main reasons for both addiction and insurgency is unemployment. Poppy, instead of being seen as a deadly crop, should be considered a cash crop. Of course, strict monitoring should be ensured,” she says. On average, the addict consumes two to five grams of opium a day. Annual consumption in the district is estimated at around 20 tonnes. A tola (11.9 grams) of opium cloth—a rectangular piece of cloth made from string nettles, and measuring about 6 cm x 8 cm, in which the extracted opium is gathered —sells for ₹400 to ₹600 depending on the quality. The life of men in almost every house in Changlang is centred on the hearth around which they gather and smoke up. (Most houses, especially those of the Tangsas and Tutsas, also have buffalo skulls hanging from the bamboo walls.) The opium cloth is first drenched in water and then slowly heated to extract the opium which is then mixed with plantain fibre and heated again. This mixture is then smoked in bamboo hookahs. No one makes any bones about the fact they they’re addicts. Tom Simai is a journalist with Arunachal Times and he’s associated with the Amazing Arunachal website. His prognosis is bleak. “In fact, the crack has begun and if it explodes, it’ll crumble everything—the hopes, the expectations, the aspirations, the families, the societies, the future, just about everything—nothing will be the same. Changlang’s business development officer Nonju Tikhak echoes Simai’s pessimism. “The truth, beyond all rhetoric and political posturing, is that the future generations of Changlang are already lost to opium,” But there’s little consensus on the possible remedies. Many of the elders I spoke to blamed it on the education deficit but said they are helpless to deal with it. “There has to be a culture of education in place. It’s missing here,” says Timjong Longchang, a teacher at a primary school in Rangkatu village. But he doesn’t want to blame the students. His children depend on Changlang, 12 kilometres away, for higher education, but the road to the district headquarters is often damaged and there are no bus services. It doesn’t help that many of the children who overcome these challenges find themselves without jobs once they complete their education. “What can you tell the children about the importance of education when they see educated people living without jobs, lost to opium? What’s the point in blaming opium or insurgency when there are no jobs?” Timjong is himself a former addict. But Nonju Thikhak is among the few I met who hasn’t lost heart. She left the state for higher studies and graduated from the National Institute of Fashion Technology (NIFT) in Delhi. She then worked in Gurgaon with a multinational firm before deciding she had enough of the “mainland”. “After a point, you start to lose your sense of self-worth because you’re not in the least important to them. I wasn’t someone who wanted to stay with north-eastern people all the time. In fact, I made it a point to mingle as much as I can with people from other states,” she says. The “emigrant life” had taken its toll on her, and she decided to return. “They (people in Changlang) need me infinitely more than any multinational company. If more educated people from Arunachal Pradesh choose to serve their own people, we can usher in a revolutionary change,” Nonju says. Upon her return she has found “great meaning” in her own love for the tradition she is part of, and in the appreciation of the “amazingly beautiful and diverse customs” it encompasses. She is as committed to her people as her sister Marina. Few people I met blamed the insurgents for their problems, even the addictions. They were indignant over reports that NSCN(K) was involved in “rampant extortion, forcible abduction of young boys for recruitment. and young girls as comfort women”. There is promptness about proclaiming the proud legacy of Naga brotherhood, shared cultural and political histories of many centuries, which binds theirs and the insurgents’ destinies inextricably together. A local policeman dreads the possibility of armed combat with them because “we are, after all, one people, one blood. How can I hold my gun against them?” There seems to be silent approval of the administration’s management style because people feel the situation is so fragile that even one false move, the slightest shift, could prove catastrophic. “I’m Naga, they’re also Naga. Why should I be against the insurgents?” Nonghki Kamba Longchang asks. The last stretch of our road in Changlang is much shorter, just five kilometres from Circuit House to “Rocket Camp” in Salang. It’s time to meet the men who matter more than anyone else in the district. The road takes us past the DC’s office, a school playground, a CRPF outpost where this day (August 31) is for weapons inspection—with the arms laid out in the open—and a church dedicated to John the Baptist. The soldiers at the camp assure us that no security problems are involved in going to Salang. But the lone soldier manning the last bunker near the bridge over the Tirap river is less enthusiastic. “Don’t blame me if something goes wrong. I’m responsible for your safety only till you cross this bridge. When you reach the other side, you’re in their area,” he says. We cross without incident and walk almost another hour before we reach the edge of Salang. At the entrance, an anti-opium campaign board hangs from a post. There’s a sense of seclusion and a silence that is at once tranquil and eerie. All of Changlang’s villages have this quality but it’s more pronounced here. A young man at the first house in the village asks us to meet the Gaon Bura before going any further. The headman’s house isn’t unlike most other traditional houses in Changlang: a two-room bamboo structure thatched with palm leaves that stand on stump-sized pillars of wood and stone. It has a large courtyard and a raised verandah at the front. The Gaon Bura is 60, soft spoken and effusive in his praise for the way NSCN(K) looks after the villagers. We’re told to wait in his house till a relative gets the permission from the camp. The bamboo walls of his house are adorned with the photographs of his sons and daughters. The women of the house look every now and then at us with curious suspicion. A little girl walks into the front room and sits beside the Gaon Bura for a while. As I’m making conversation with the old man, we’re interrupted by four armed men in uniform who barge in as if they own the place. There are no questions, no explanations, they simply blindfold the three of us and drag us out—I presume because I can’t see—to the Gaon Bura’s courtyard. They have come prepared. They have been tracking us since we landed in Changlang. They know where we have travelled, the names of people we have spoken to, the times at which those conversations happened, and what our questions were. They were everywhere. It’s something we had never bargained for, though we can’t say we weren’t warned. The sentry’s words come back to me. Nobody can guarantee us here at this moment. There’s nothing we can do but beg for our lives, which we do, but all the uniforms keep insisting that we are army intelligence. Our protests have no effect. They drag us off to the upper reaches, stopping at three points in between to shower more beatings. At one place, I hear children play, and women laugh. Somewhere else we’re tied to a post. The rifle butts rain in. Eventually, we’re dragged out of the village into the hills. I can tell because we’re climbing, somewhere very high. We can’t see a thing because of the blindfolds. Meanwhile, my asthma inhaler and a scar on my chest are being interpreted as recording instruments: they keep asking me if these are “chips”. Deepu’s locket too is considered a “chip”, and they take it away from him. The blows by now have become a sideshow, like kicks to a whiny dog no one cares about. Their focus is on interrogation. They really do want to know where we come from. The three of us are questioned separately. 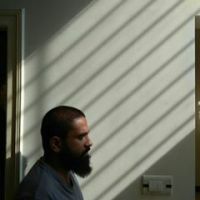 Later, Deepu Philip, who last year was interrogated by the army at the border with Pakistan while on a photojournalism assignment in Rajasthan, tells us the two interrogations were remarkably similar. In between, we’re given a laddu each. After a while, they take down our phone numbers and contact details of our families. It sounds ominous, my heart sinks. I’m ordered to recite a Christian prayer. (Most of the NSCN(K) cadres are Baptist Christians.) They make us say they’re not our enemies, but bhais. They say they’re not terrorists, but freedom fighters, they’re fighting for justice. We’re infiltrators here and this is just a small price we have to pay. “When you enter a foreign country without permission, you have to be punished for infiltration,” one of the militants said. The mosquitoes seem to be huge and bloodthirsty, and there are some other unknown insects feasting on our flesh and blood. One of our captors is kind enough to keep them away by swatting at them. Finally, he unties my blindfold on orders. The stars are out and it’s an unforgettable sight, the most beautiful sky I have ever seen: a gloriously radiant crescent moon and a million, billion points of light winking at me, as if a watercolour’s been hung up there. From what I can tell we were in custody till around 6 p.m. After a while, my friend of the mosquitoes comes up and tells me not to worry. “We will not kill you,” he says, adding something about how the Assam Rifles had started targeting them recently. That doesn’t mean they won’t beat us. Then I hear Munna’s voice. He’s begging the insurgents to stop the beatings. Maybe there’s a little hope now. The orders are finally issued; we’re to go down. But I can’t walk; my ankles are gone. My new friend carries me all the way. When we get there, he reminds me again that they’re not bad people and asks me to pray for him and the cause. Munna is waiting for us with a senior NSCN(K) man not in military uniform, and to whom the other uniformed cadres are very respectful. We’re told to beg for forgiveness. This senior man then asks us if we want to die by pistol or a big gun. Our final release orders come from this man. Munna confides to us that it is in his “risk” that we’re being bailed out. He takes us to Circuit House in his car, takes us to our room, and confiscates our laptops, and cameras. We are then taken back to another vehicle, a Bolero, with NSCN(K) men. They are there to ensure that we are out of Changlang. They drop us at Margherita and warn us to never return or write about this incident. Postscript: The Changlang police have registered a case, and one person has been arrested so far. According to Vijay Kumar, SP, Changlang, an investigation is underway. At the Raba’a el Adaweya mosque, thousands of Egyptians protest and pray day and night. 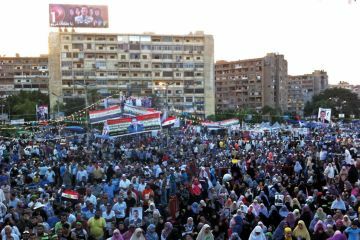 What began as a pro-Morsi protest has now transformed into a pro-democracy one. 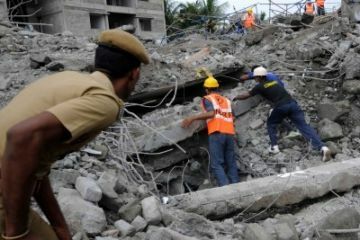 Sixty-one construction workers died when a building collapsed in Chennai. One year later, there has been no recompense for those affected even as the government denies all blame.